No one likes pus. It’s goopy, gross, and sometimes smelly. It's also a symptom of infection. Here's why it happens—and how to make it go away. Trust us—you don't want to see the "before" photograph. 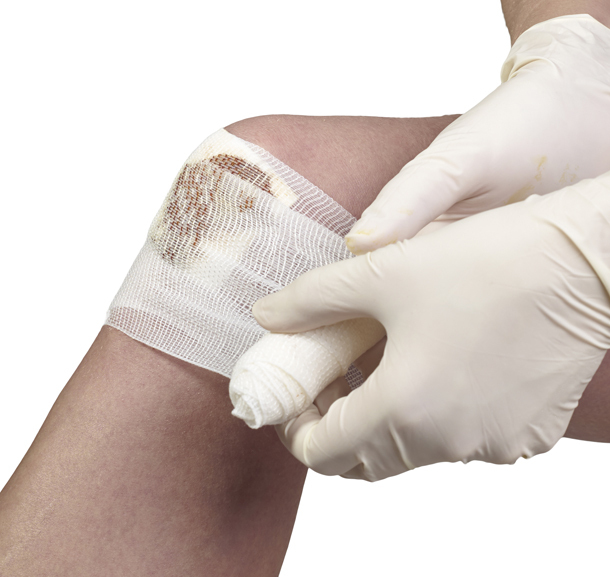 The bandage is covering an unsightly batch of pus—a sign of infection that's being fought off by your immune system. You had a fall and suffered the tell-tale scrape on your knee. Within a week, it’s filled in with green pus. Don’t worry, there’s no alien at play here. Pus is a sign that your body’s defense system has kicked in. All you need to do is figure out what caused the infection your immune system is trying to fight—and learn how to treat it. First, let’s learn a bit more about what pus is. Yes, it’s gross. Yes, it can be smelly. And yes, it’s a sign of infection. But what is pus made of? And what is a pus infection? Pus is a thick, opaque, often whitish-yellow or brownish-yellow fluid that’s formed during an inflammatory response (i.e., in reaction to an infection). Pus is made up of dead white blood cells (a.k.a. macrophages and neutrophils), bacteria, and other tissue debris produced during the body’s immune response to the infection. In other words, pus is a natural byproduct of your body’s healing process. It’s akin to an error message on your computer, alerting you to the fact that there’s a bug in your system. Remember your old friend pimple? Pimples form when pus gathers near or on the skin’s surface. Same goes for a pustule. An abscess is created when pus builds up in an enclosed area of tissue. Pus can appear anywhere—on your tonsils, face, inside a joint, on the brain, or in the gastrointestinal tract, for instance. According to Rebecca Baxt, MD, pus is caused by “collections of white cells called neutrophils that our bodies are making to fight infection.” It’s our body’s way of telling us that something’s not right. How Do You Treat a Pus Infection? The key to getting rid of pus is to “treat the underlying infection,” says Rebecca Baxt, MD, a New Jersey-based dermatologist. Treatment will depend on the type of infection you’re fighting. To treat a minor pus infection—a pimple or very small skin abscess, for example—at home, try this: Apply a clean, warm towel to the pus infection. Hold for five minutes to reduce swelling and open the skin to help speed healing and encourage drainage. An abscess is frequently caused by bacteria. This localized, enclosed collection of pus can occur anywhere in the body and is most often accompanied by swelling and inflammation—two of the main signs infection. An abscess is proof that the body is trying to fight an infection. A bigger buildup of pus, especially one that’s not easily accessible (e.g., in the mouth or under the armpit), may require a doctor or surgeon’s help. He or she will likely make an incision and drain the infected area. Large or hard-to-reach abscesses. These may need to be surgically opened to drain pus. Recurring ear inflammation or infections. Grommets, or small plastic tubes, may need to be inserted in the ear to aid drainage. Septic arthritis. A surgeon may need to drain the joint to remove infected pus before administering antibiotics. What Does Green Pus Mean? Pus can appear as many different colors, including whitish, yellow, green, or brown. The color is caused by the accumulation of dead neutrophils (i.e. white blood cells). In some cases, pus is accompanied by a foul smell. Green pus Pus appears green due to an antibacterial protein called myeloperoxidase. It’s made by certain white blood cells. Green pus is a potential warning sign of a pseudomonas bacterial infection caused by a bacterium called Pseudomonas aeruginosa. This color of pus is often accompanied by a foul odor. Yellow pus A possible indicator of a staph infection or strep. Brown pus A brown pus infection could be associated with a liver infection. Reddish pus Pus spotted with red usually means blood has seeped into the infected area. alcohol, antibiotics, antifungal, arthritis, bacteria, bacterial infection, brain, ear infection symptoms, gastrointestinal, immune system, infection, inflammation, myeloperoxidase, pain, protein, septic arthritis, severe pain, skin, staph infection, trouble breathing, white blood cells.